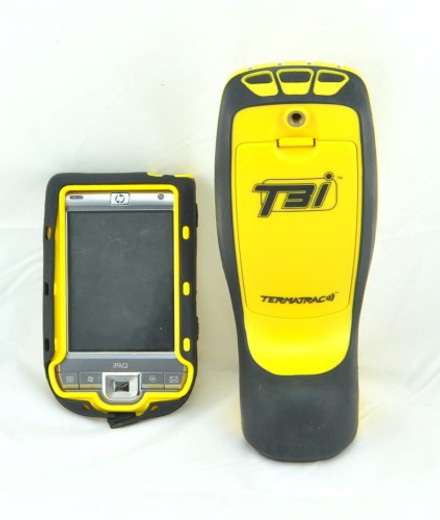 A Termatrac T3i is an Australian invented tool specifically designed to help detect termites before they become visible. The Termatrac has 3 features Radar, Moisture meter and Thermal laser. Radar- When set to radar option the T3I ( Termatrac ) emits a microwave radar that is able to penetrate some building material like timber, tile, plaster board and some others. The radar will send a signal that is blue toothed back to our phone if movement is detected behind the area scanned therefore giving us reason to recommend a more invasive inspection. We use this feature a lot particularly when we get an indication by our Termite Detection Dog to give us some back up with a possible termite indication. You should understand that the radar will not penetrate through foil ( sarking ) or steel and T3i has to be put where the activity is to work effectively. Moisture Meter- When set to this setting it works much the same as most pest controls have a Tramex moisture meter but they have just incorporated it into 1 tool. As termite can create mudding behind walls and humidity in timbers moisture can be emitted which can be detected if placed in the right area. We tend not to use this feature too much as we have a thermal camera which is able to give us a larger picture of your walls than what we can scan with the T3i however sometimes it is import for us to have available to use when needed. Thermal Laser- This feature gives us a pin point temperature of a spot which we can work out if there are any variations created by termites or moisture. We do not use this feature as we have the Thermal Camera which gives us over 78,000 measuring point in the screen compared to 1 with the T3i. A Termatrac is a very important tool in our industry for doing termite inspections. It is very important for an inspector to have if you are looking at having a termite inspection or timber pest inspection done. As on a concrete slab home where termite entry points are usually covered by concrete paths, lawn or gardens. We can not see the termites entering the building therefore making an inspection less accurate. The new Australian Standards that have just been updated recommend the use of a Termatrac or radar machine.